Recently, one of our readers asked if we could write a tutorial on how to add a full screen search overlay in WordPress. You have probably seen this on popular sites like Wired. 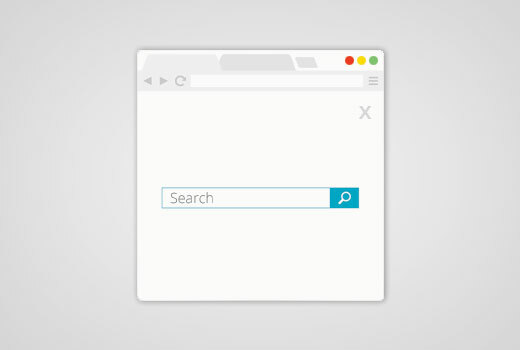 When a user clicks on the search icon, the search box opens up and covers the whole screen which can improve user experience on mobile devices. 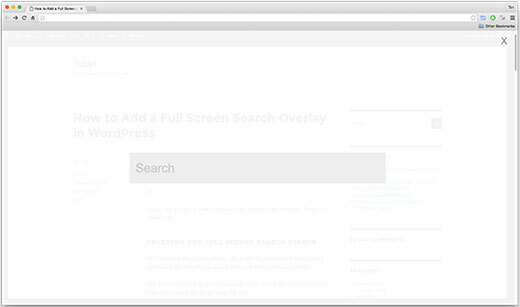 In this article, we will show you how to add a full screen search overlay in WordPress. The full screen search is slowly becoming a trend because it drastically improves the search experience for mobile users. Since mobile screens are very small, by offering a full screen overlay, you make it easy for users to type and search on your website. When we first got this tutorial request, we knew it would require some code. Our goal at WPBeginner is to make things as simple as possible. Once we had finished writing the tutorial, we realized that it was too complicated of a process, and it should rather be wrapped into a simple plugin. To make it easy, we have created a video tutorial on how to add a full screen search overlay that you can watch below. However if you just want to follow text-instructions, then you can follow our step by step tutorial on how to how to add a fullscreen search overlay in WordPress. First thing you need to do is install and activate the WordPress Full Screen Search Overlay plugin. For more details, see our step by step guide on how to install a WordPress plugin. WordPress Full Screen Overlay Search plugin works out of the box, and there are no settings for you to configure. You can simply visit your website and click on the search box to see the plugin in action. Please note, that the plugin works with the default WordPress search feature. It also works great with SearchWP, which is a premium plugin that greatly improves the default WordPress search. Unfortunately, this plugin does not work with Google Custom Search. The WordPress Full Screen Search Overlay plugin comes with its own stylesheet. In order to change the appearance of the search overlay, you will have to edit the plugin’s CSS file or use !important in CSS. First you will need to connect to your website using an FTP client. If you are new to using FTP, then take a look at our guide on how to upload files to WordPress using FTP. You will find a file full-screen-search.css inside css folder. You need to download this file to your computer. Open the file, you just downloaded in a plain text editor like Notepad. You can make any changes to this file. For example, we wanted to change the background and font color to match our demo website. In this code, we have only changed background color at line 62, and added font color at line 150. If you are good with CSS, then feel free to change other style rules as well. Once you are done, you can upload this file back to plugin’s CSS folder using FTP. You can now see your changes by visiting your website. If you are using this in your own theme, then it’s better to use !important tags so the plugin updates wouldn’t override any changes. For developers and consultants, you can also just rename the plugin and bundle it as part of your theme or services. We only created this plugin because all other ways of writing this tutorial would’ve been too complicated for beginner users. Does this plugin work with woo commerce? I need a full screen search function that just searches my site for woo commerce products. I want to make a submit button below search box , when a full screen overlay search appears. I have tried adding normal input button and button tags as well in the full-screen-search.php, but it doesn’t work. How to accomplish it. Thanks for this amazing post but I am trying to integrate this full screen search with the google custom search just like wpbeginner search. How can I do that? “This empty space is added by “Full Screen Search Overlay” plugin. I tried to test with default WordPress Theme (TwentyTwelve) and I can also see additional empty space on the bottom. Great Plugin! Any chance of adding an option for using “Esc” key to close the search? Great post and very good plugin! Thank you!! 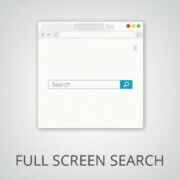 Is it possible to add a functionality that makes the fullscreen search box closes when we press the “Esc” key? This is awesome. Very straightforward. How can I make the overlay only a percentage of the screen, rather than the whole thing? I’d like to add a search engine on the help pages of my WP, which are accessible for members only. Can you tell me how to make a restriction for the search engine to the help pages, and not for the whole website please? Now all we need is a “child theme” plugin that works with plugins rather than themes…. Nice Post. I am just searching this from the last some time. Looks great! The only problem I have is that a margin appears below the footer. I’ve got the same problem. Did you ever find a fix? Same here! Any update by chance? Same problem here. Margin appears below the footer. Any update? Ok, so… Care to share?